Where was I? I started writing this post two weeks ago and then non-bike related business took me off-track. And the story actually happened almost a month ago. Time to catch up! 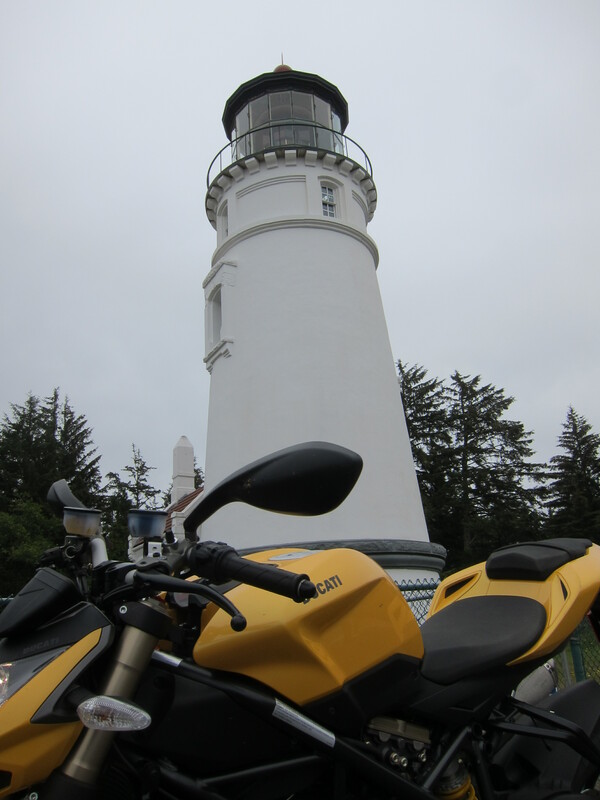 Back to the July 8th ride to Winchester Bay, Oregon. 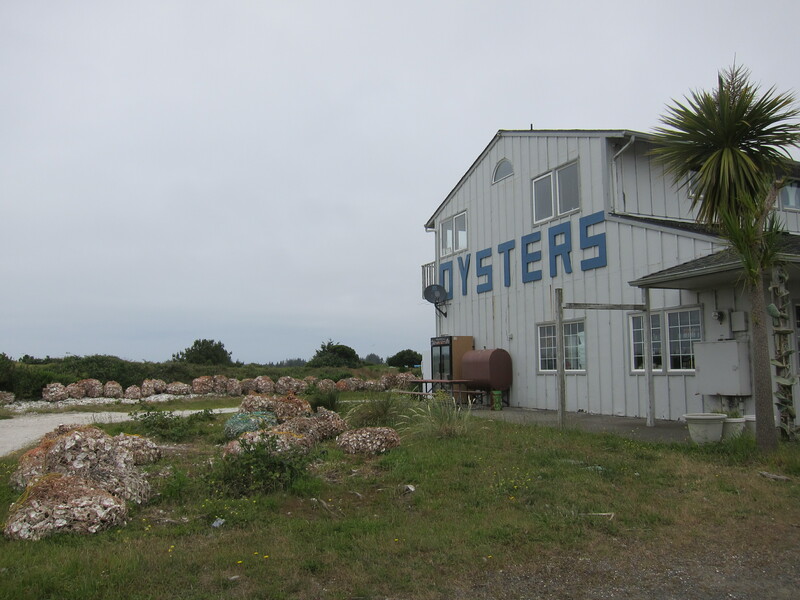 Continuing from my last post, the plan was to check a renowned Oyster operation in Oregon, located in Winchester Bay, just south of Reedsport. I know of people from Eugene who will drive all the way there to get their oysters. 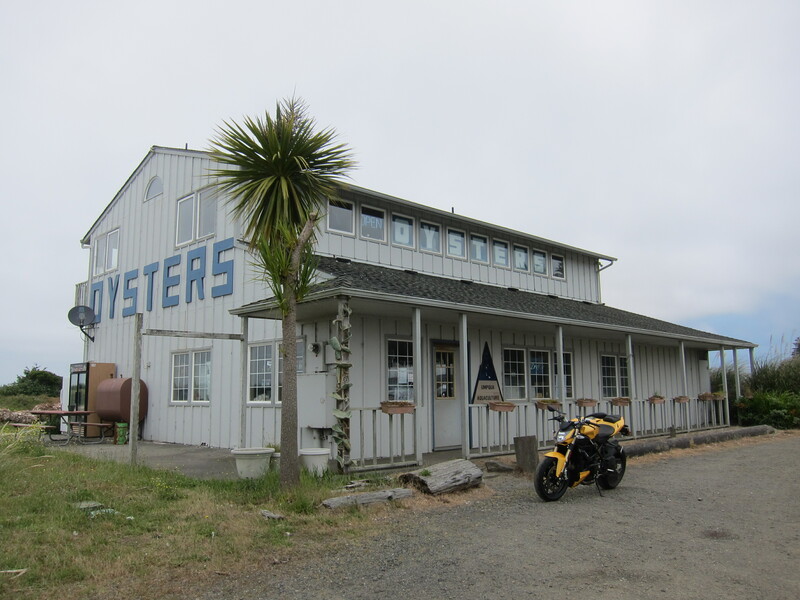 As a matter of fact, the first oysters I ate here in Oregon were from Winchester Bay. 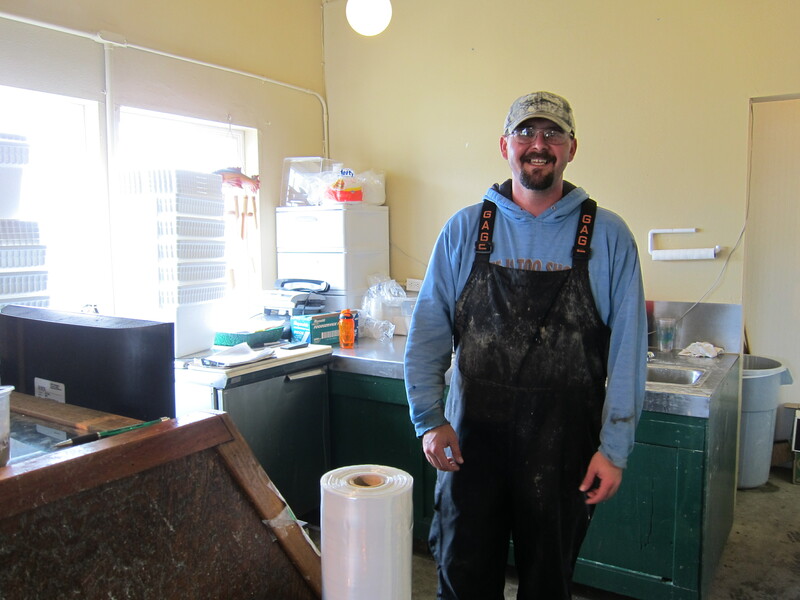 I had to check their operations and I also wanted to know more about oyster farming in general. But the bottom line is that I wanted an excuse to go for a ride. 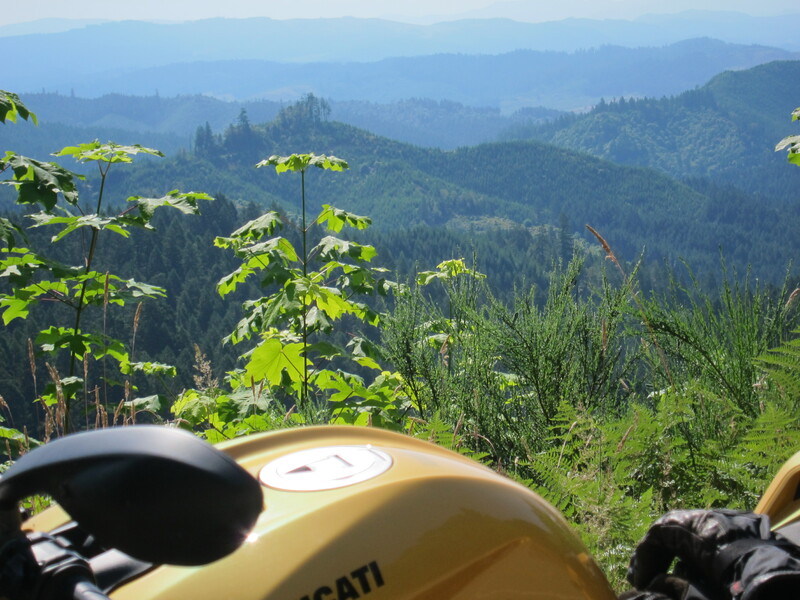 The Ducati was my mode of transportation for this trip and I was riding Hwy 38 towards Reedsport when I decided to take a detour that led me into getting almost lost in the many small roads that make a maze in the Oregon Coast range. After a while on that maze I was trying to find my way back to Hwy 38. I had made a left turn at some point and was hopeful that it was the right way to take me back to Hwy 38. And I’m glad to announce that going left on that intersection was the right way to go. 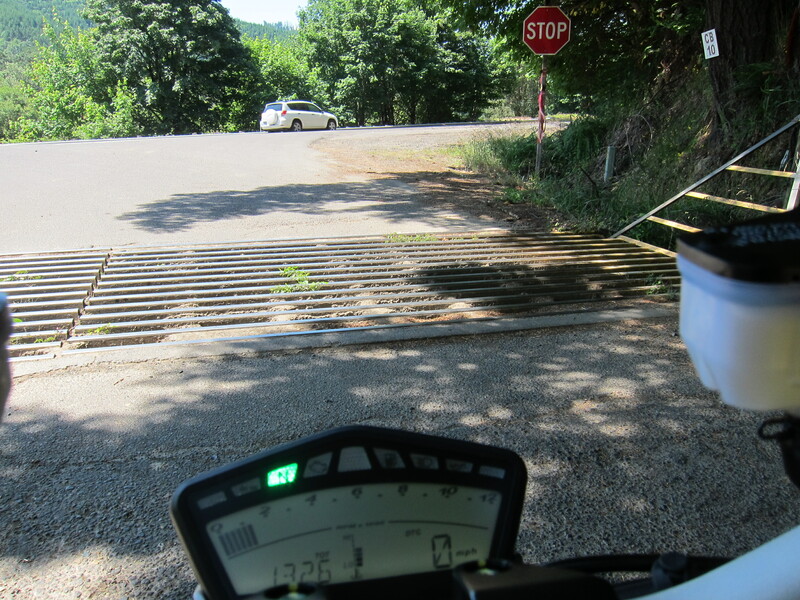 At 1,326 miles on the odometer, the exact mark I needed, the bike and I made it back to Hwy 38. 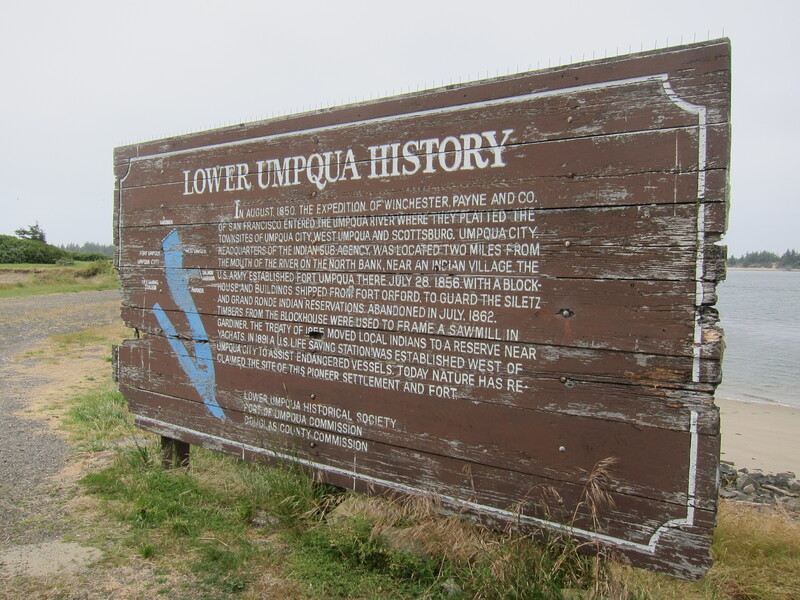 Highway 38 eventually follows the Umpqua river. I want to make a note about the wind. The one challenge on naked bikes is that you don’t get any wind protection. No turbulence is good, but a strong wind coming straight at you, plus your speed of travel, plus riding on this wind for several miles, and the fun is diminished some. However I really like the absence of turbulence from not having a fairing. It makes for real motorcycle riding, in my humble opinion. This river gets to be pretty massive when it gets closer to the ocean. From here I was quickly in Reedsport and on Hwy 101, and from Hwy 101 I went south and it is a very short hop to get to Winchester Bay. Once at the bay it is not difficult at all to locate the Oyster operation. 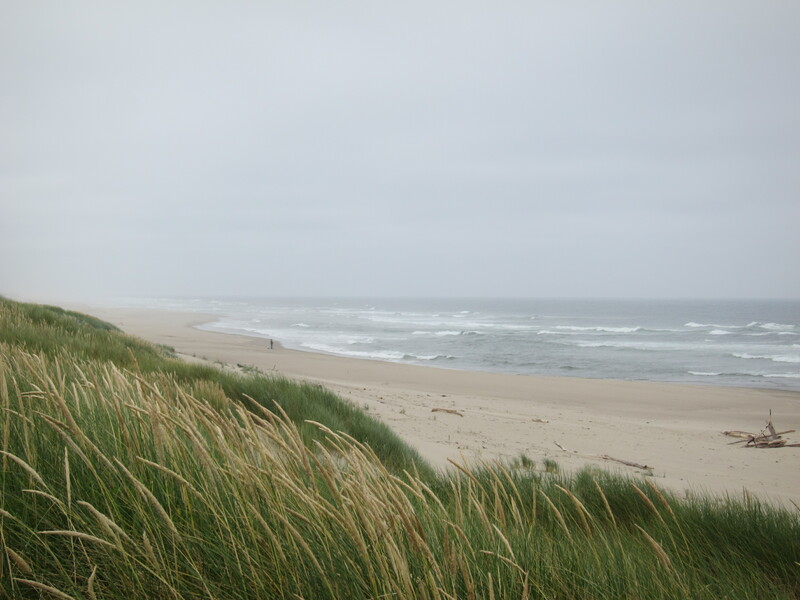 As it has been usual on my trips to the coast, it was a lot cooler by the ocean and the skies were blanketed with clouds. 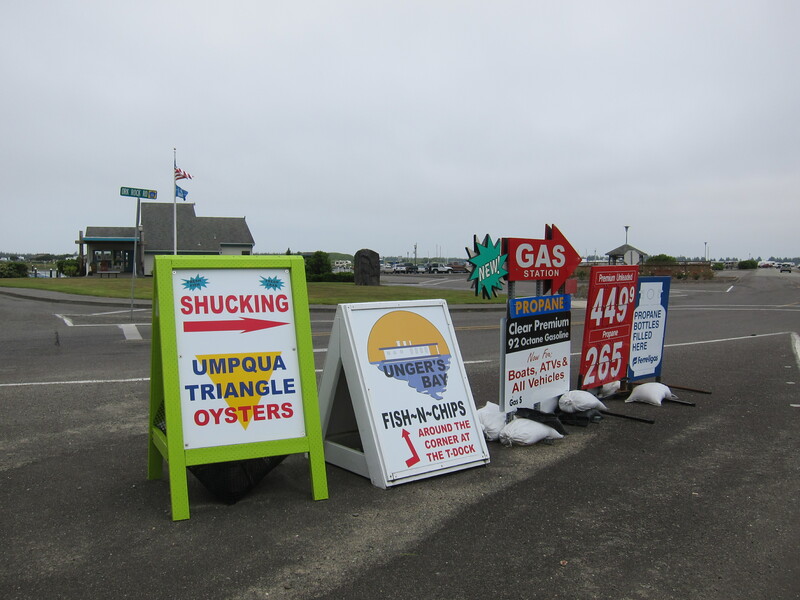 I followed the signs toward the Umpqua Triangle oysters, the only oyster operation in the bay, which is officially called Umpqua Acquaculture. Is it around here by any chance? 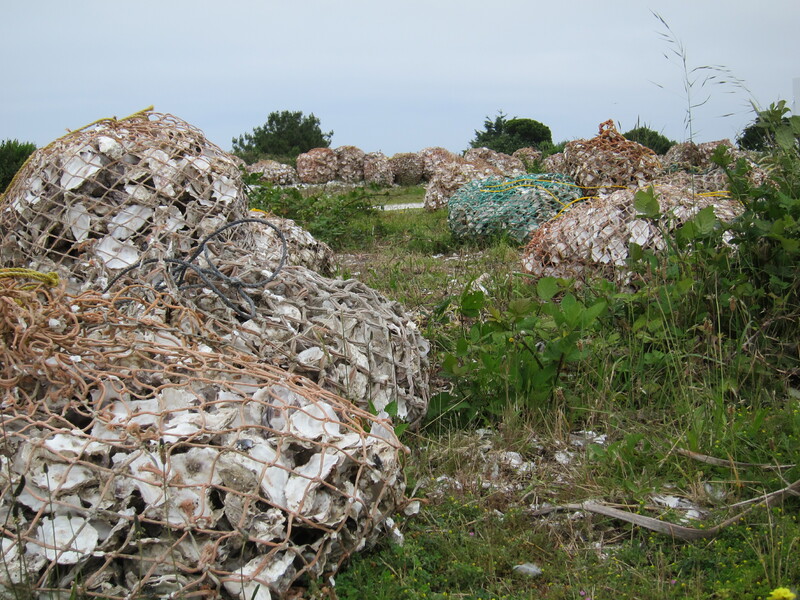 The piles of oyster shells are a give away that I was on the right track. I wanted to talk to the manager of the operations. I arrived at lunch time, he was not there, so I decided to explore the area and return later. The river is very wide at the point it gets close to the ocean. 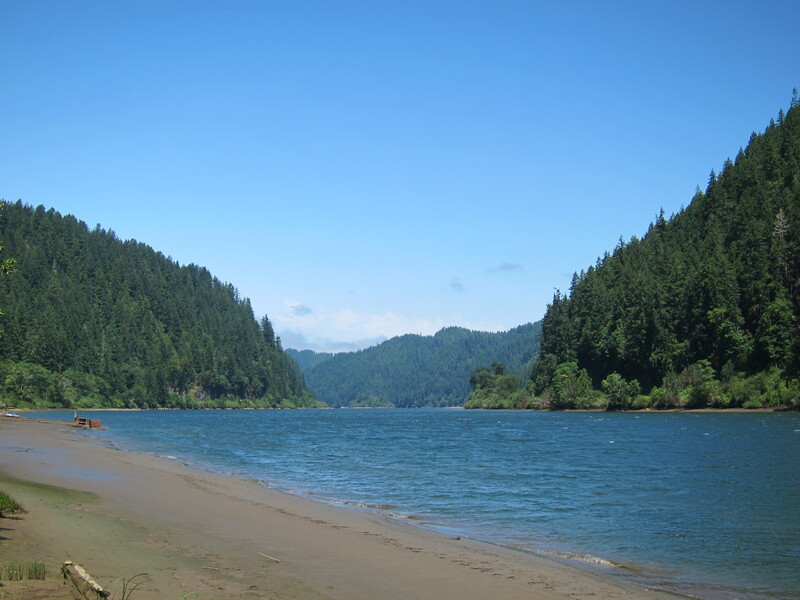 Umpqua River, closer to the Ocean at Winchester Bay. Below, a brief story detailing when the colonizers first arrived in this area (1850). When I read things like this using today’s lenses, with today’s perspective which I hope includes an acquired dose of respect and understanding about nations and other people’s lands, it doesn’t sound too good for us, descendents of the Europeans who came to the Americas in the 16th and 17th centuries. And not only then, we still have a long way to go to resolve some of our ethnocentric views. Touchy subject, I know. A brief description of the history of the area. There is also a light house in this area. 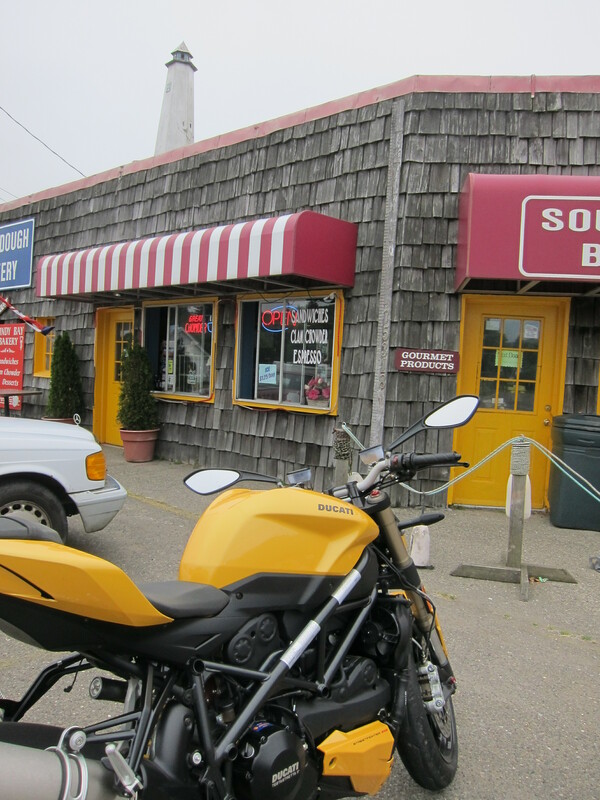 I was here for the first time last year, when I started my Hwy 101 / 1 tour to the Golden Gate Bridge with the Triumph. 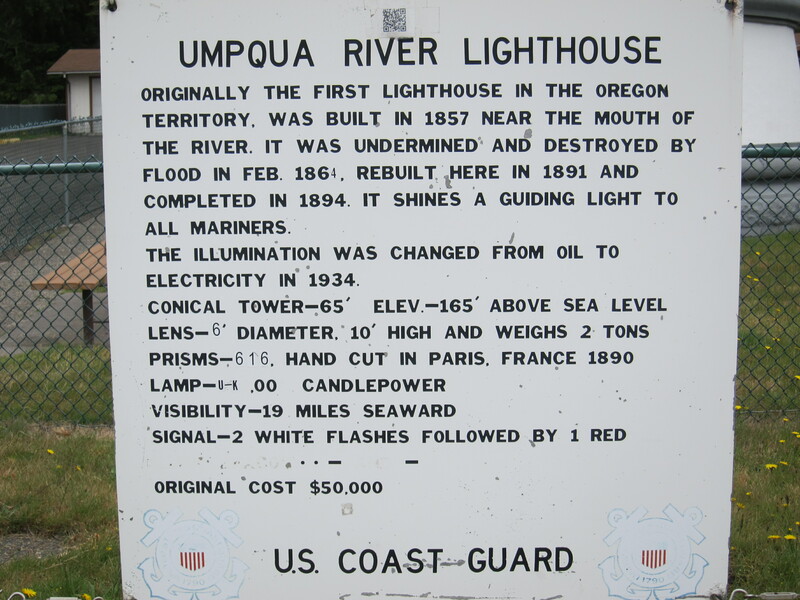 Umpqua River lighthouse, looks better with a touch of color. 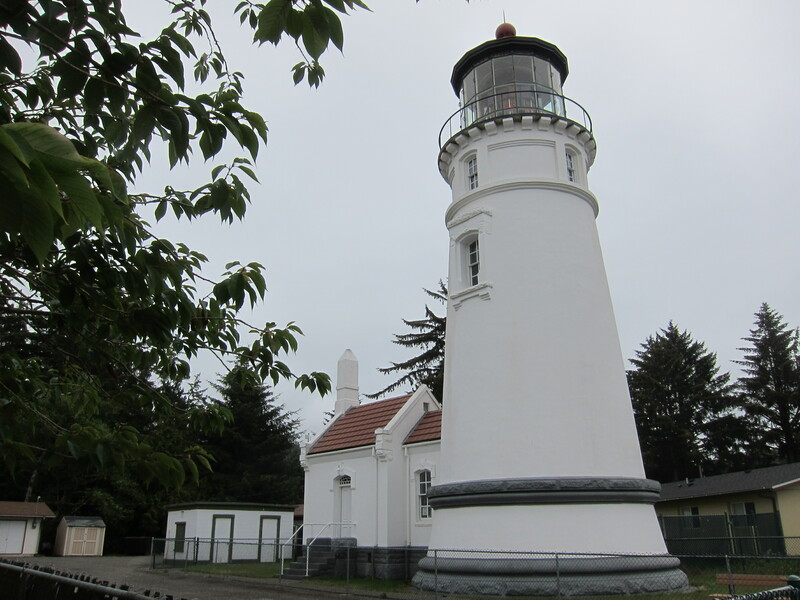 Originally the first light house in the Oregon region, it was built to a cost of 50,000 dollars. 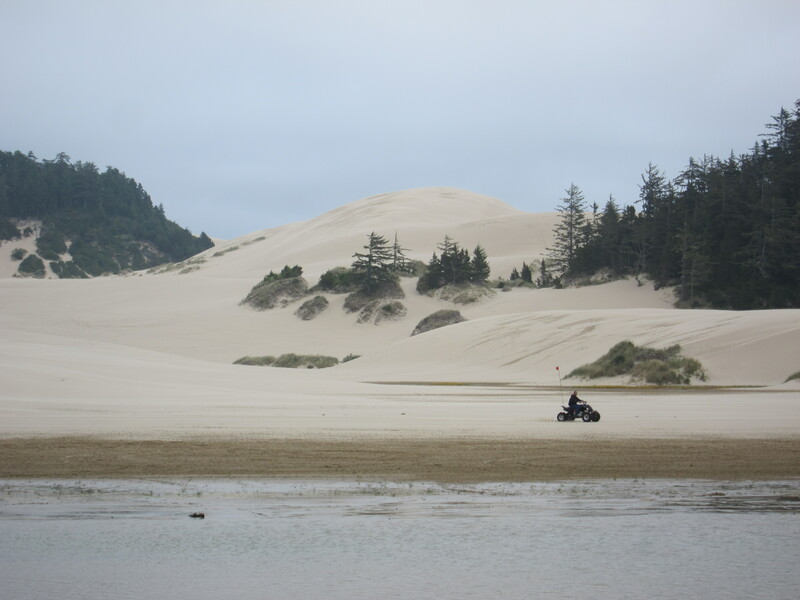 From here you can see the sand dunes, which are part of a system of off-road vehicle recreation areas on the Oregon coast. And you can also see the Oyster farm. 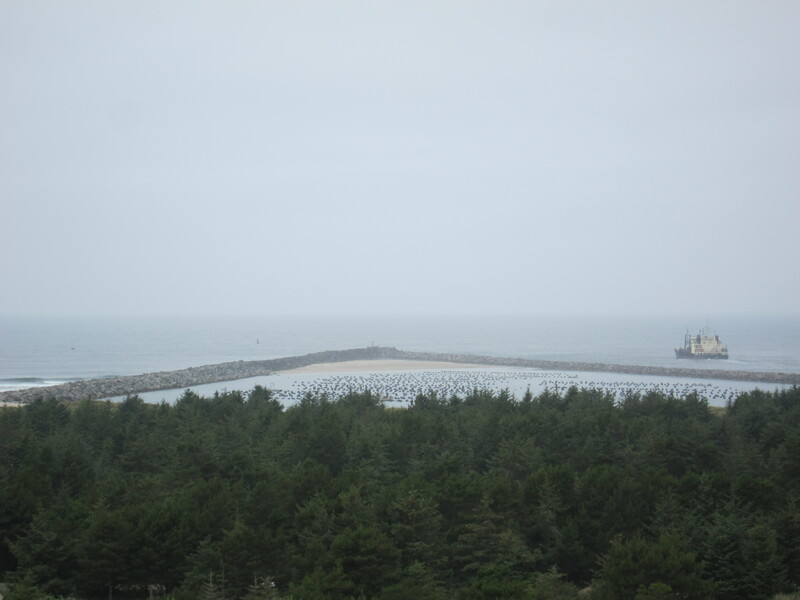 The triangle area squeezed between the Ocean and the Umpqua River is leased by the Oyster farm, which gives its Triangle nickname. This operation is about 21 years old. 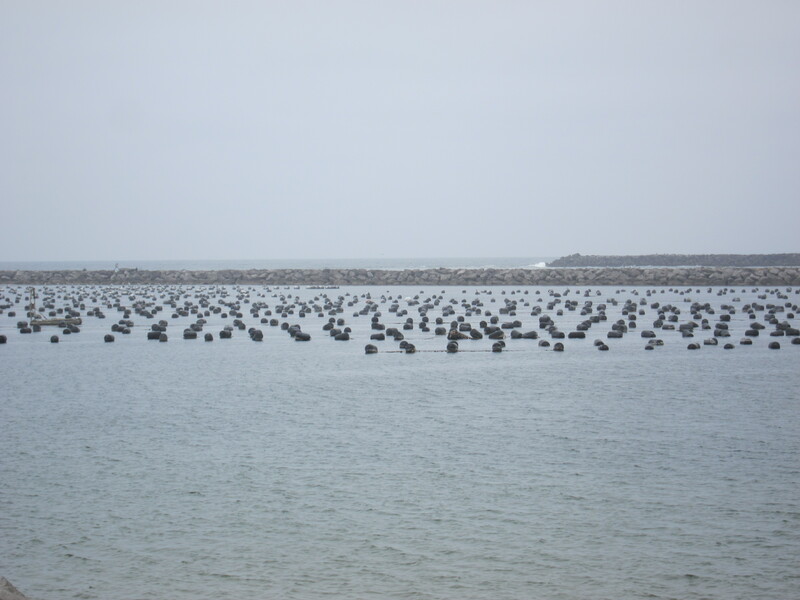 Oyster Farm, the shape that makes the name. 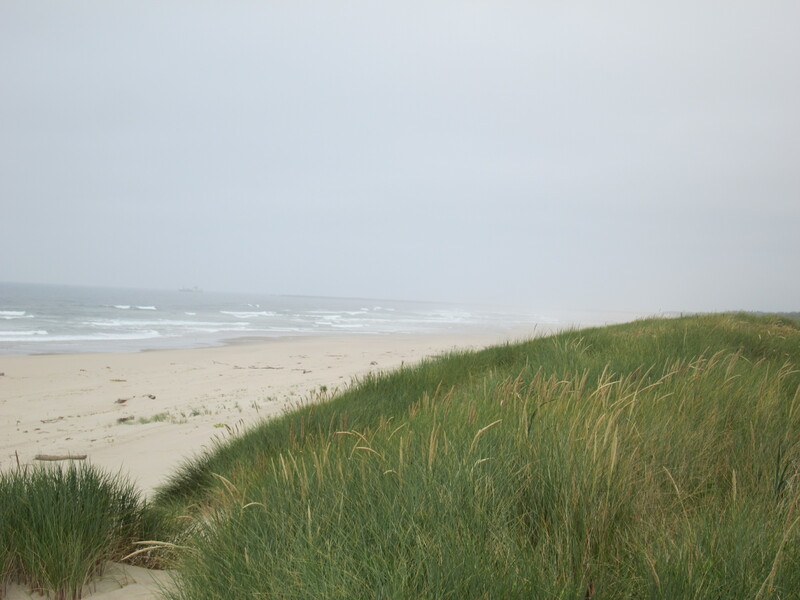 I decided to go check the ocean, the dunes and the farm. On the way to the Ocean. 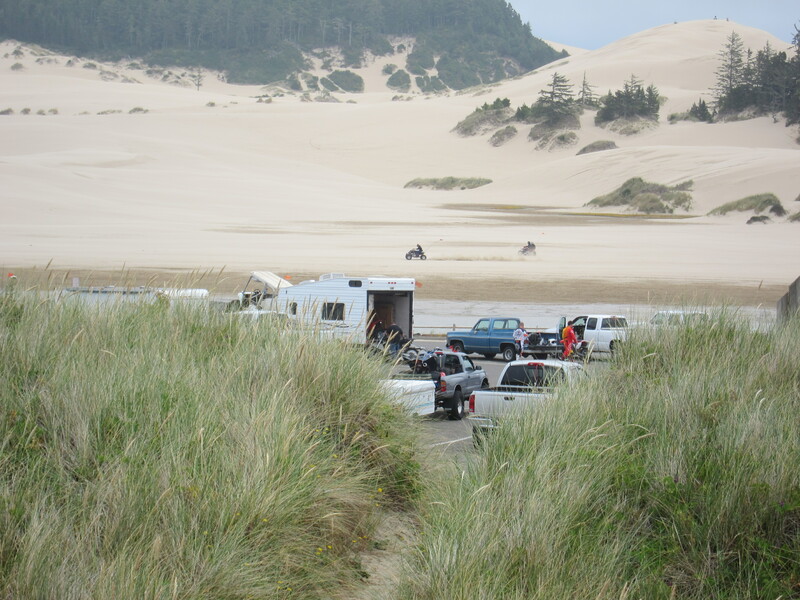 I parked the bike on one of the staging areas for the dunes recreation area. But first I wanted to check the ocean. 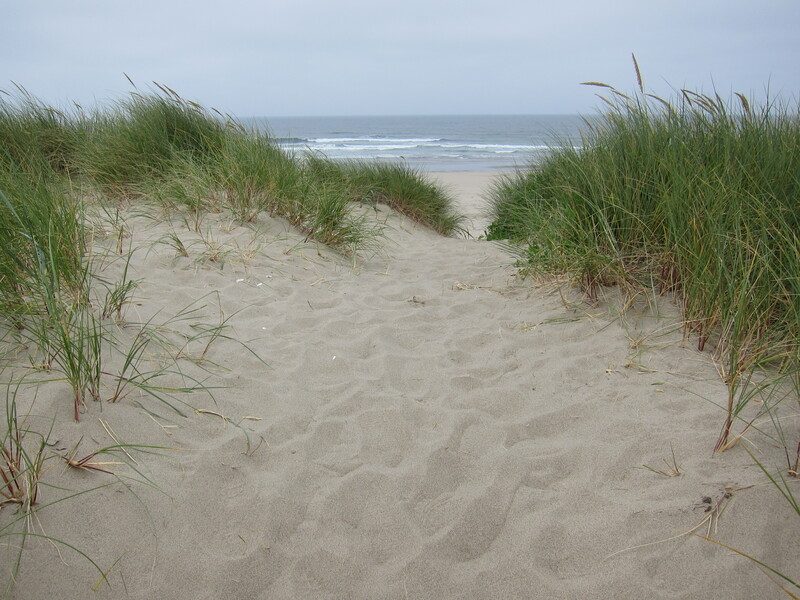 Images like this one below, of a path crossing the dunes to get to the ocean, the grass, and the view of the ocean, take me back to my childhood every time without failure. Those were great summer days, when we walked to the beach, crossed the dunes, with my mother and my sisters and all the paraphernalia (umbrella, chairs, towels… ) and on weekends my father would join us. That was another ocean, another hemisphere, but it all looks so similar, and I still look with anticipation for that final stretch when I finally get to see the water. What a pull the ocean is. And here the Ocean is all yours. Except for the lone fisherman and a couple of other people that were walking, this area is pretty much clear of people. 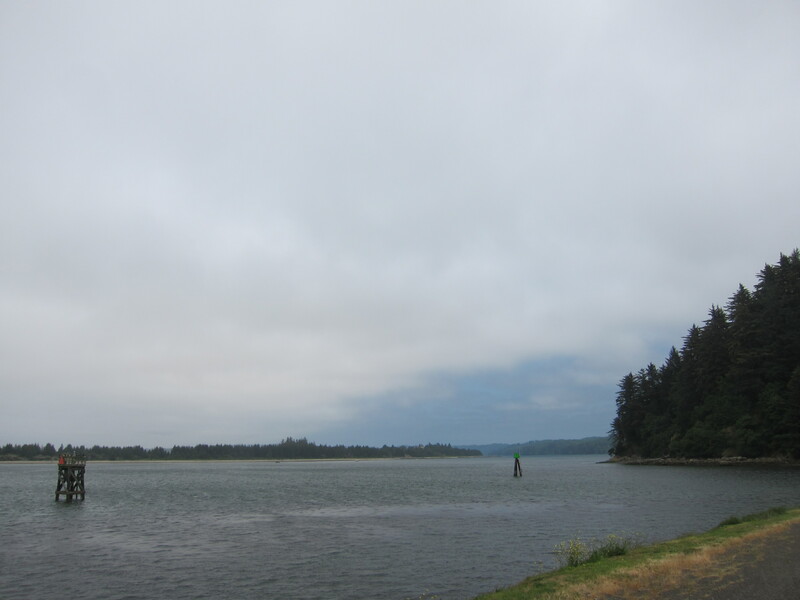 Looking north, you can barely notice the jetty that provides the boundaries and the water movement stability for the oyster farm. It is different when attention goes to the interior, to the fun on the dunes. 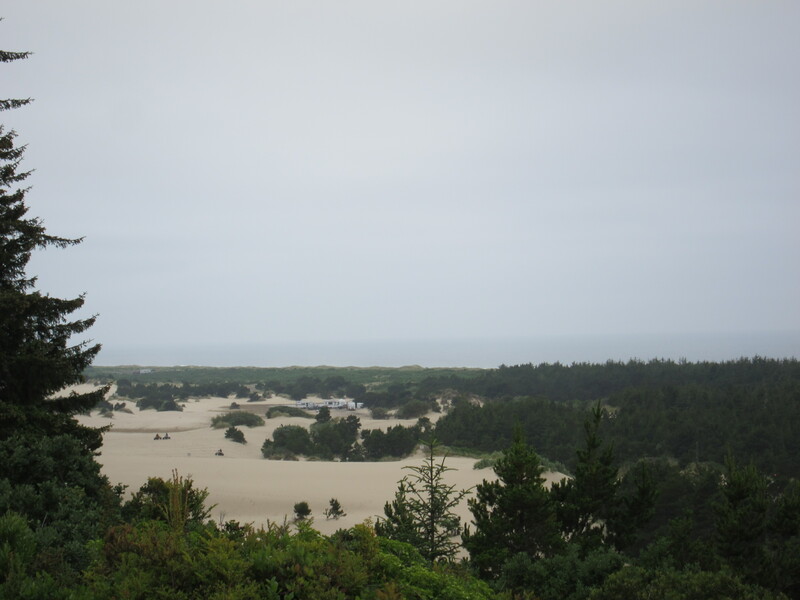 Looking back towards land, you can see one of the many staging areas for the dunes. People bring all sorts of toys to play here. A gigantic sand box for “kids” of all ages. Not too many rules. I always wondered how the Yamaha would fair on the sand. The Ducati did not want to have anything to do with it. People were having lots of fun. It was Sunday, July 8th, some people were probably here since July 4th. Others just come for the weekend or for the day. Time to go check the Oyster farm more closely. Below is a ground level view of that triangle area, what you see are the floats from where the oysters are strung vertically. The triangle area, oyster farm. The floats on a closer view. 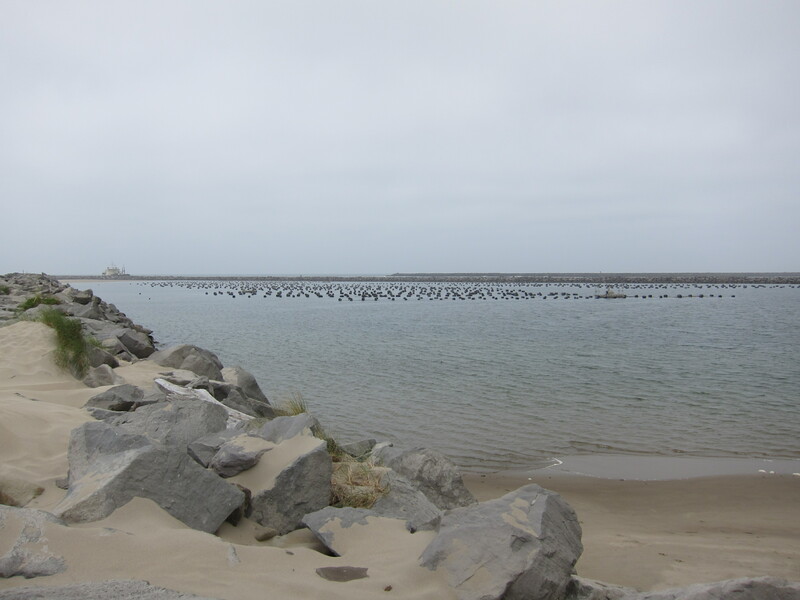 The oyster farm and the mouth of the river, trained between two jetties. 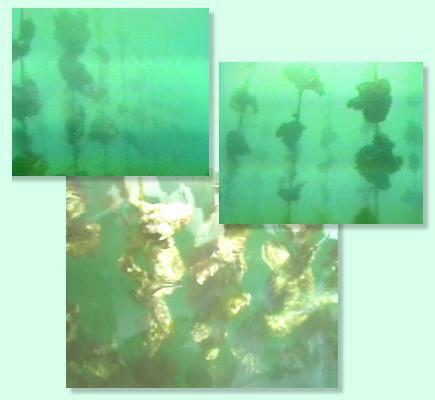 And this picture, taken from the website of the Umpqua Acquaculture Oysters farm, shows what it looks below the water line. Oysters strung on a long line. Never touch the bottom. Picture from Acquaculture farm. You can read more about this technique at their site. But they claim this is one of the reasons their oysters taste better. And I can attest they taste really sweet. Time to go back to the headquarters of the operation. 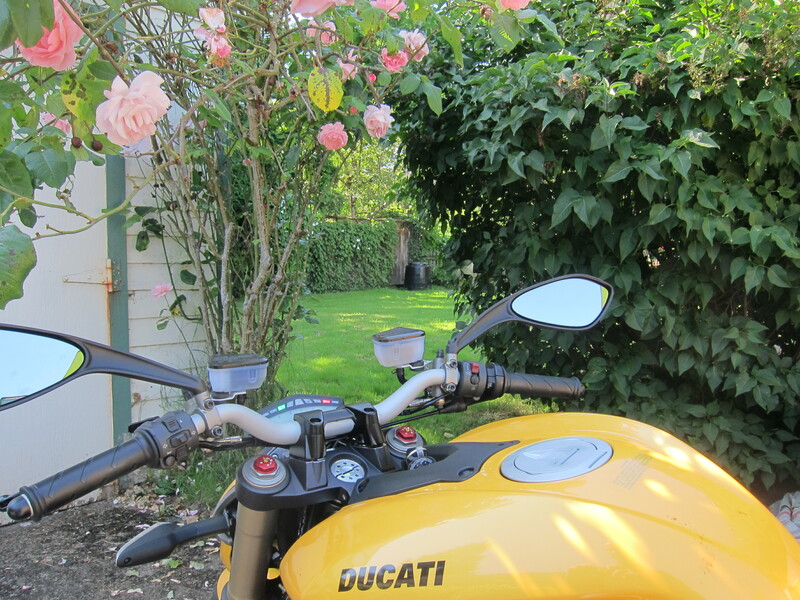 Yes, the Ducati was with me, my travel companion. And here is where they shuck the oysters. I spoke with the supervisor, who went out of his way to explain things to me and answer my questions. 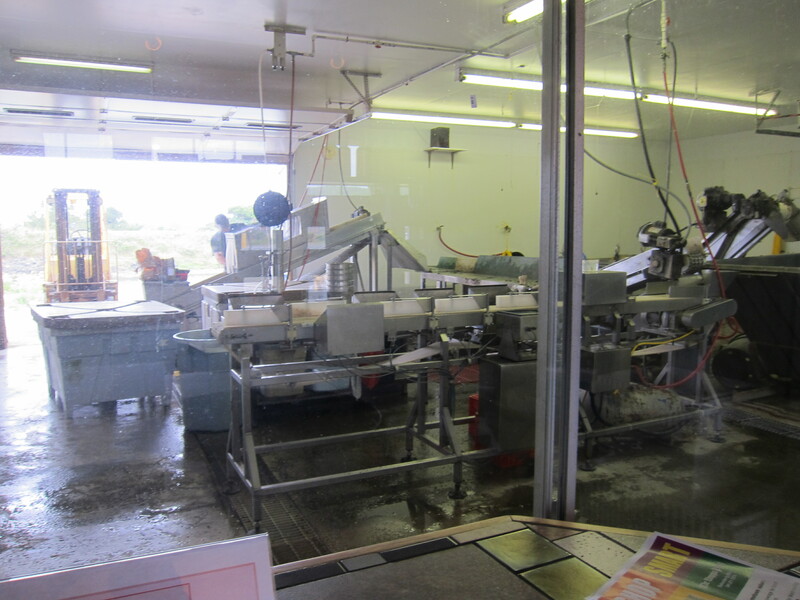 A few interesting bits: this farm is a mom and pop business, established here since 1991. They sell almost exclusively to over the counter patrons, so you will not find these oysters in supermarkets, but you may find them in small restaurants along the coast. You won’t find someone selling wild oysters on the Oregon coast. Organic, yes, wild not. The supervisor of the operations. People who love oysters love life. They savor the wondrous sights, sounds, fragrances and flavors of all nature’s bounty. Although oysters can be an acquired taste for some, they’re ambrosia to others. The Greeks envisioned their goddess of love, Aphrodite, springing forth from the sea on an oyster shell and giving birth to Eros, from which the word “aphrodisiac” was born. Oysters are said to have been revered by the Roman emperors who paid for them by their weight in gold and sent thousands of slaves to the shores of the English Channel to gather them. Casanova is reported to have eaten 50 oysters a day while taking his morning bath, and one can only imagine their importance to Anthony and Cleopatra. It’s also been written that a person without a taste for oysters may well be without a soul. For those who are health-conscious, oysters are not only delicious but one of the most nutritionally well-balanced foods, containing protein, carbohydrates and lipids. They’re high in omega-3 fatty acids and low in cholesterol. Oysters are an excellent source of vitamins A, B1, B2, B3, C and D. They have high mineral content including iron, copper, iodine, magnesium, calcium, zinc, manganese and phosphorus. Much is talked about oysters, and their role in life, right? Myth or reality? I will stay away from this debate. Anyway, it was time for me to go back home, this was a long day already, when thinking about that adventure on the Oregon Coast Range maze. But first I stopped for a quick bite to eat at the Sourdough Bakery. I didn’t want to eat too much as I had a nice meal waiting for me at home. And a couple of hours of fun later, I was home. This was a 237 mile trip (381km) and the Ducati had 1,475 miles on the clock when the day was all done and it was safely parked in the garage with her friends. A typical weekend for me and for the Ducati. I have yet a couple of other rides to report, and a few non-riding posts to prepare. It is a lot to catch up considering work sequestered my riding and writing time. 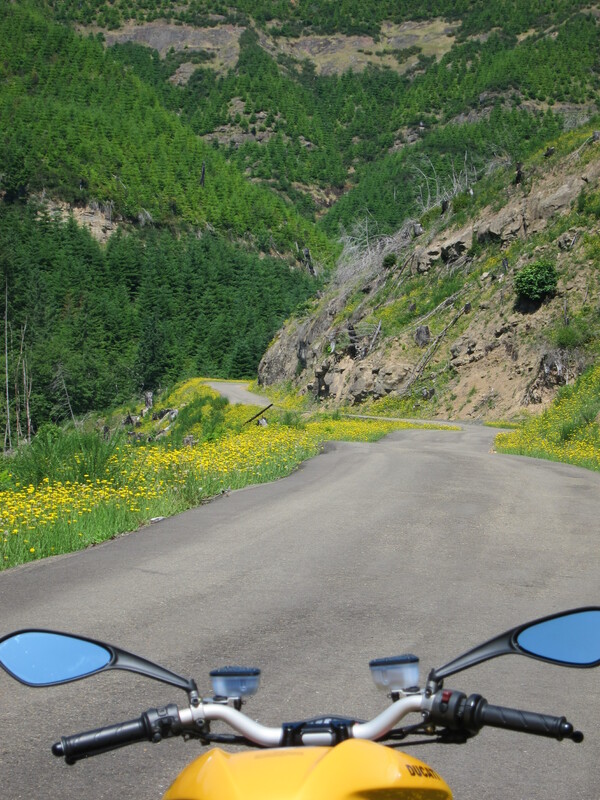 But first I will go for another ride because today is Sunday, and it is Summer, and last Sunday I was out of town and because I miss that Ducati! 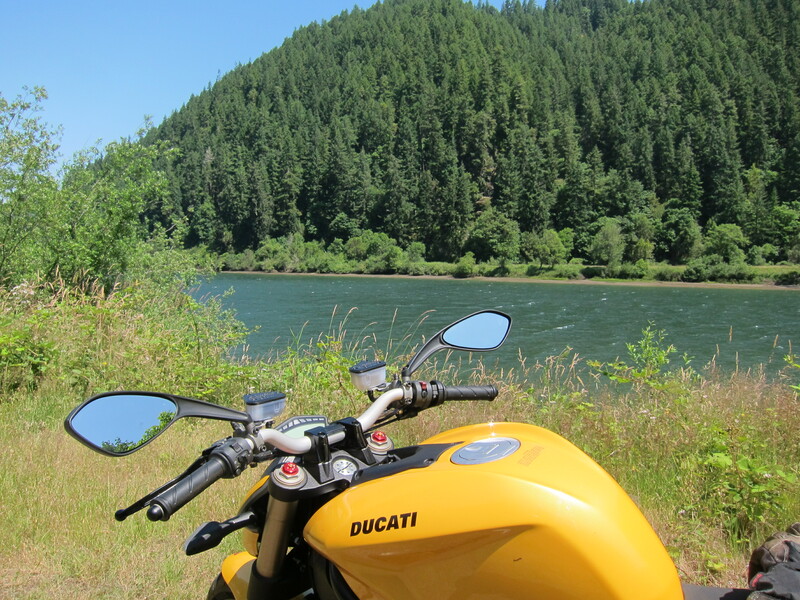 This entry was posted in Riding the Ducati. Bookmark the permalink. What a brilliant tourguide you would make. 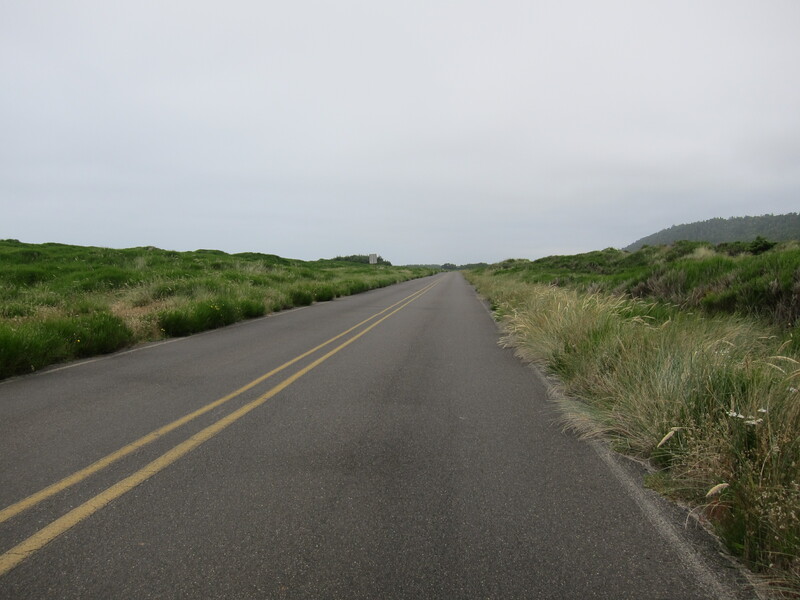 I will put this area on my list of things to do when returning to the Oregon coast (maybe next year). Thanks so much for all the informative snippets along your journey, I enjoy it very much. 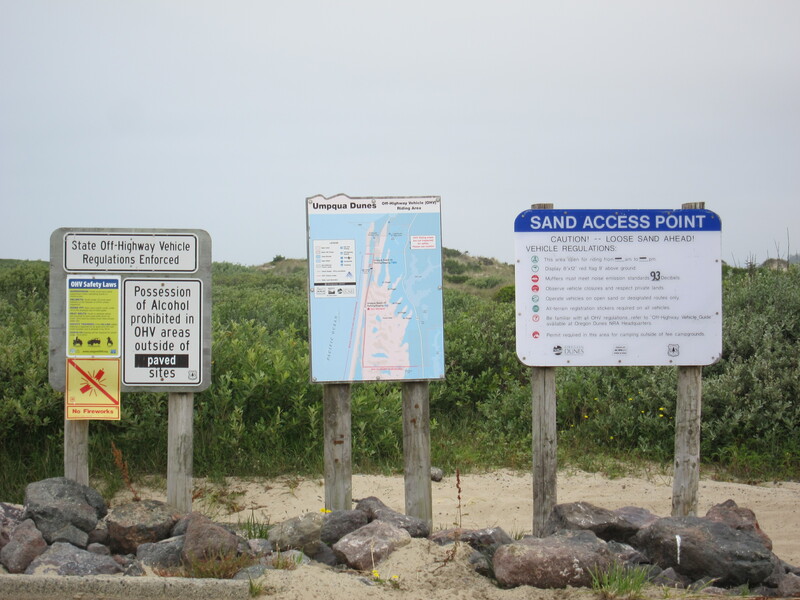 Not sure I like the sandunes to be mistreated as recreational spot for all kinds of motorized vehicles. It is a highly sensitive area, and should be protected. Thank you Sonja. Maybe I’m using this blog to build my resume as a tour guide, a career change. :-) And to think it is all about finding lame excuses to ride that bike. And about the sand dunes and motorized vehicles, I thought about it. I wonder how much of it is protected. It is big business around these parts.